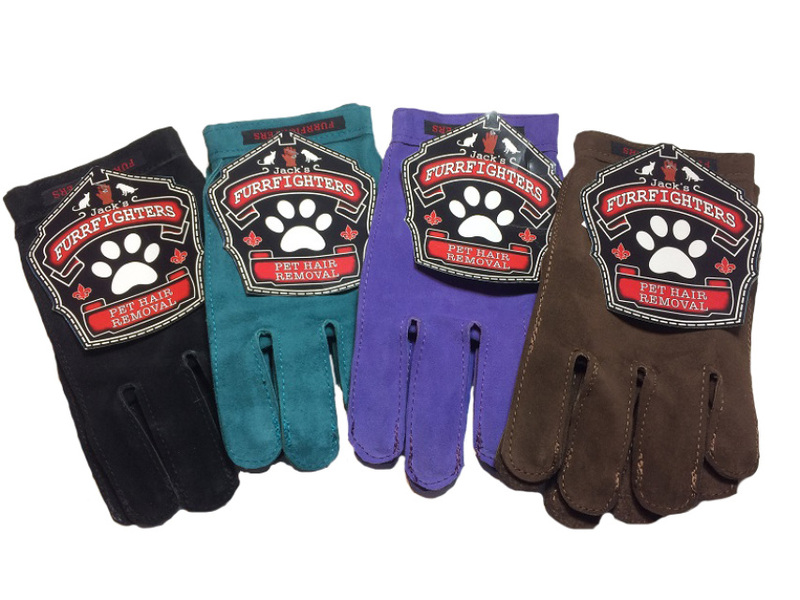 Check out the video on the FurrFighters website, linked above, to see how they work and how easily they’ll eliminate your excess pet hair problem. The FurrFighter collects the pet hair, and a firm tap allows for quick and easy disposal. As an added bonus, your pet will love being groomed by their FurrFighter and will proudly show off their soft, shiny coat! 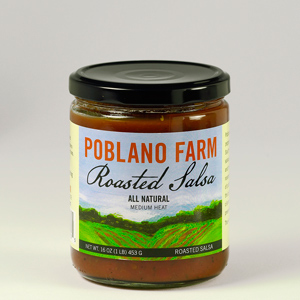 Poblano Farm Salsa and Sauce: South Kingstown is a small community in far southeast Rhode Island – it’s adjacent to Narragansett and just a few miles from the waters of the Block Island Sound. It’s an excellent agricultural area – the ocean moderates the climate and provides ideal growing conditions. The town is home to Poblano Farm, a family run operation that has been making quite a name for themselves for their line of salsas and pasta sauce. 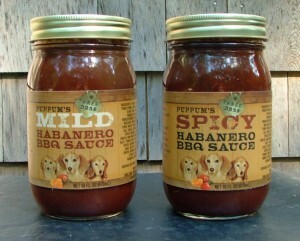 Their three salsas – Roasted (medium heat), Chipotle, and Mild have been featured on the Cooking Channel along with their signature pasta sauce. The pasta sauce features farm grown tomatoes and no added sugar. Taste the delicious sweetness of Rhode Island grown tomatoes and see why they’re sought out all over New England! You can find Poblano Farm products at select markets in The Ocean State as well as online at their website’s store. 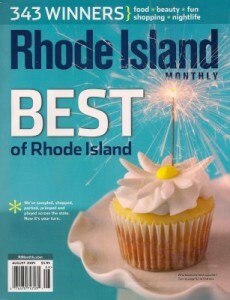 Give the gift of Rhode Island freshness and flavor! The sauces, which come in Mild and Hot varieties, are thicker in consistency than your normal barbecue sauces, which make them all the better for dipping and spreading on sandwiches. If you like a little bit of hot but still want the flavor foremost, try the Mild. Like things a little hotter? The Hot’s for you – you’ll get the nice habanero pepper blast you’re craving – try it pasted on pork chops before grilling for a special treat! 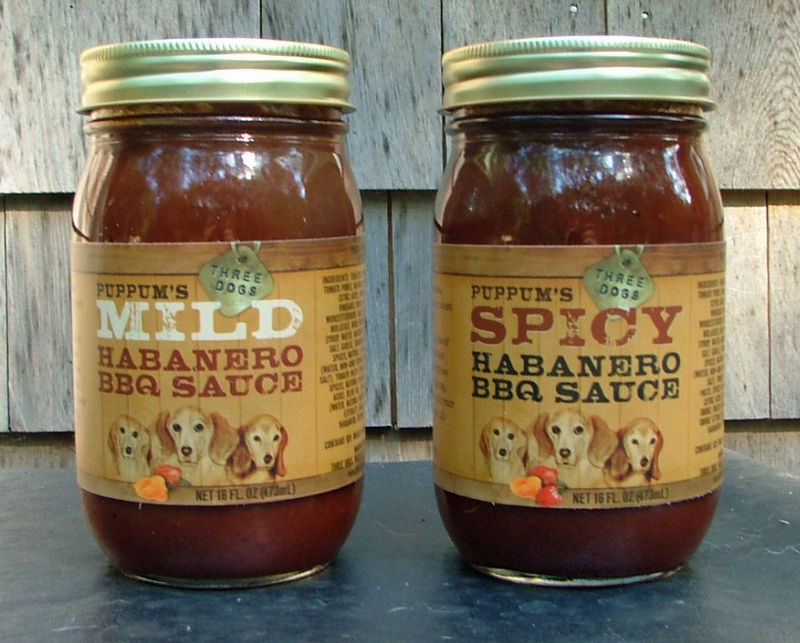 At the Three Dogs Sauces website, you’ll find a list of area stores where the sauces are available, and you can also order online. We especially like the jars they’re packaged in – wider mouth to help you enjoy every bit! As an added plus, proceeds are donated from every jar sold to local animal rescue groups. Great stuff from The Ocean State! And that’s exactly what jewelry artist Flori Nelon of Newport does. In addition to owning her own shop in the iconic seaside resort town, she operates an Etsy store called Sea Glass Boutique. There you’ll see beautiful pieces of sea glass jewelry, each ready to be shipped directly to you or the doorstep of your gift recipient. 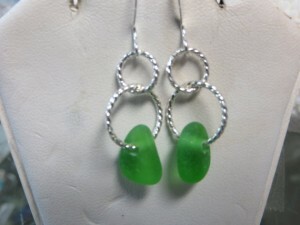 Sea glass jewelry is a wonderful, personal gift and we can’t think of a better Made in Rhode Island wearable! That’s exactly what happens at the Travis Family Farm in North Scituate, RI (west of Providence just off Route 6). Founded and operated since 1994 by David and Lillian Travis, the couple’s seven children are instrumental in the farm’s success. Each have their specialties, from caring for the farms herd of goats and other animals to cleaning barns and delivering products. And this small farm produces a lot of products! 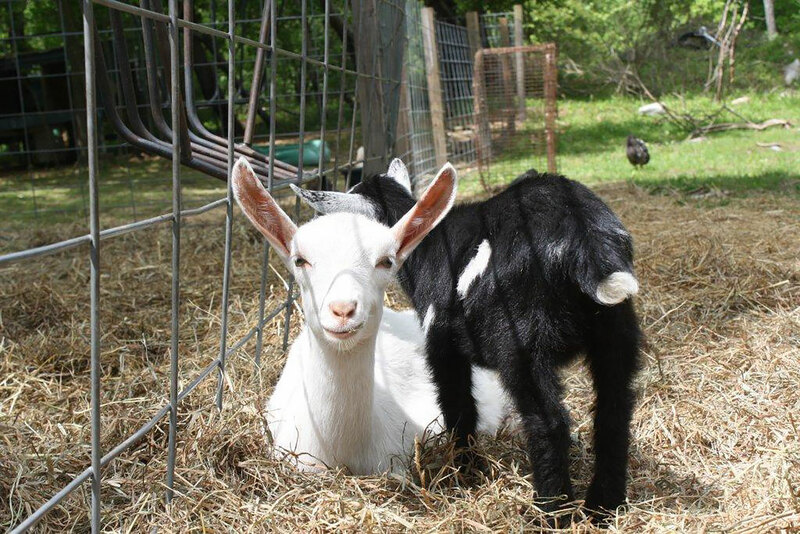 A Couple of the Farm’s Photogenic Goats! At the Travis Family Farm website, you’ll find twenty different varieties of their soap, including Eucalyptus Mint, Vanilla, and Lilac & Lily – there’s even a bar especially made for your best dog friend! See how soft and shiny your pal’s coat will be … you’ll never go back to harsh dog shampoo again. Fantastic gift ideas, direct from the heart of The Ocean State. Help support America’s small family farms! It’s the Rhode Island Favorites Cookbook and it contains 200 Ocean State recipes, submitted by Rhode Islanders. A perfect gift, the book contains how to instructions for creating everything from the state’s Italian-American specialties to seafood dishes to NY System Hot Wieners (see below for more about them!). You can order this cookbook directly at the site linked above. There’s also an option to purchase a downloadable e-book version which you can access from your computer and print out pages as needed. Enjoy! Scialo Bros. Bakery: Have you ever spent time in Providence? We’ve visited twice before and it’s on our agenda for our ongoing “Visiting America’s State Capital Cities” travelogue feature. 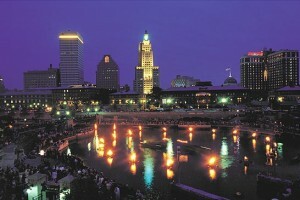 Providence is an underrated New England city and if you like to eat, you won’t go wrong here! The city’s Federal Hill area is filled with wonderful places to shop and enjoy a meal. 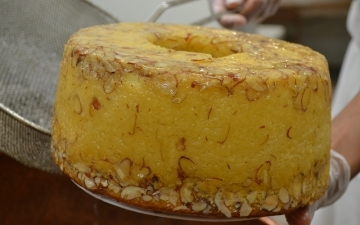 If you’re a fan of traditional bakeries, you’ll find an American gem here – Scialo Bros. Bakery. They’ve been creating some of the best baked goods in the city since 1916 and their old school brick ovens are something to behold. The bakery has been featured on The Food Network and is beloved throughout the New England area. Best known for their bundt cakes, cookies, and specialty breads, make it a point to stop here if you’re visiting Rhode Island. For those of you who can’t, you’re in luck, because Scialo Bakery can now ship many of their famous baked goods across the country. If you’re looking for a gift for someone who’s from The Ocean State, you can’t go wrong! Click through to the bakery’s website and see all they’re creating. We can guarantee you from personal experience – whatever you see tastes even better than it looks! From the farm’s goats come a variety of liquid, scented, and unscented goat milk soaps. If you’re looking for a natural gift idea from The Ocean State, consider the Liquid Goat’s Milk Soap with Copper Pump shown. It includes a handsome mason jar containing the soap and is available in lavender and lemongrass – refills are available as well. Silk Tree Farm offers goat milk soap bars in various scents, including peppermint, sandalwood, and eucalyptus mint among others. At their online store, you’ll also see an enticing collection of soy wax candles, poured right on the farm and featuring a burn time of 80 hours each. Soy candles are environmentally friendly, soot free, and offer a clean burn. 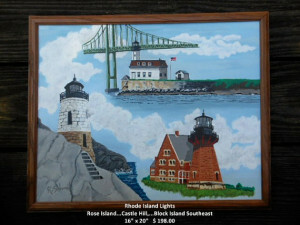 Ideal as a Rhode Island made gift! 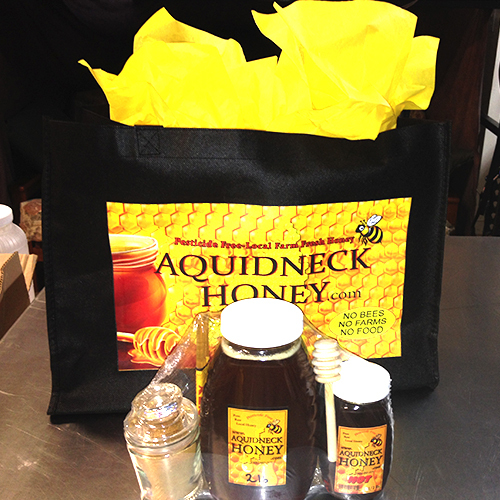 We’re pleased to showcase Aquidneck Honey from Middletown, very near Newport and just a few short miles to the ocean shore. The company produces wildflower honey, hand cut honey comb directly from the hive, and a special “hot” honey infused with Ghost and Trinidad Scorpion Peppers (great for using in recipes!). They also make a few specialty products, like lip balm, honey straws, and honey infused local milk chocolate. You can order their honey and other products directly at their website, along with several handsomely packaged gift sets like the one shown. Enjoy the great taste and health benefits of local unprocessed honey, direct from The Ocean State! The company also makes products which are ideal for children’s science projects. 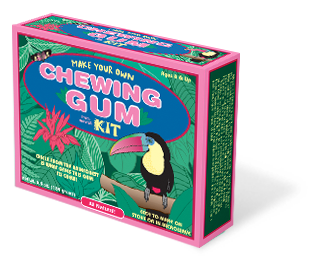 Make Your Own Gum Kits allow you or your children to actually make gum at home. 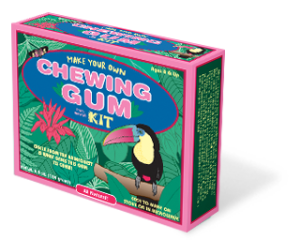 Each kit makes anywhere from 30 to 50 pieces of gum and contains all the base ingredients and a step by step lesson plan. You can make gum from the kit in about an hour or less! In addition to gum kits, you can also buy kits for gummies and candy, as well as refill kits. Glee Gum is available both online at their website or at specialty retailers across the country – there’s a store locator feature to find the nearest store to you. A great idea and a great product from Providence! A Sicilian inspired recipe, Catanzaro Pasta Sauce is chock full of all the good stuff – fresh tomatoes, garlic, basil, pure olive oil, and natural herbs and spices. You know what to use it on! Kristen’s many baked creations include a few specialties not often seen … Italian Pepper Biscuits, Anisette Toast Biscuits, Italian Butter Ball Cookies, and more. Ideal for a party tray or as a hostess gift! You can order them individually or in some of the themed gift baskets available at their online store. 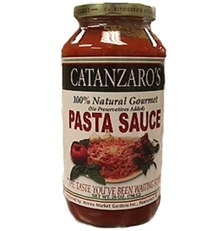 Catanzaro Food Products are available in Rhode Island specialty food markets, as well as their website. Buon Appetito! Iggy’s doughboys are best described as a fritter and they’re a very popular side dish. They can be served plain or sprinkled with powdered sugar or sugar and cinnamon for dessert. As for the chowder, it’s available in both red and white varieties, as well as Rhode Island style (clear). Everything on the menu is inexpensive and served promptly – a great place for a fun meal! If you’re a boater, take a look at their Boating / Fishing section, featuring several of their useful and good looking products emanating from Nantucket Bound’s original focus. Great gifts for anyone who loves life on the water, direct from The Ocean State! 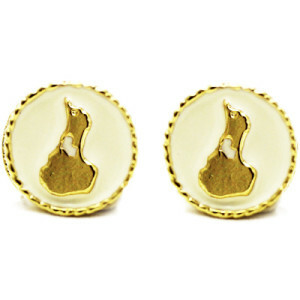 Check out their website to see all the handsome pieces available. Special orders are accepted as well! And on your next visit to southern Rhode Island, stop by their showroom for an up close and personal look – they’ll be glad to see you! Each piece of sea glass is personally collected by Mary and her daughters – and then the creative process begins! 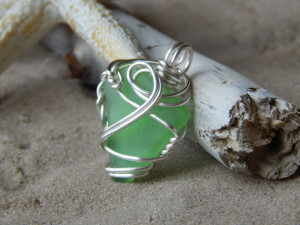 Items like the stunning pendant shown are hand crafted with silver plated wire and offered for sale at the It’s All Washed Up Etsy store. Due to the nature of sea glass, every piece is completely unique, creating a one of a kind gift that is distinctly Rhode Island! Their special Butterkase Cheese is available to be shipped anywhere in the country. This German style cheese is semi soft with a mild flavor that is best served room temperature. It’s an excellent cooking cheese for any sort of recipe or simply to melt atop a hamburger. Butterkase makes a wonderful grilled cheese too! 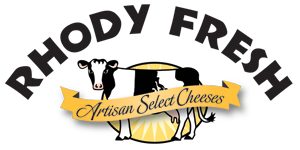 Rhody Fresh cheese is available in half pound or one pound increments at their online store. You can also order special Rhode Island themed combinations and gift baskets. Enjoy the taste of Rhody Fresh! Shore Soap Company produces a wide variety of bath, body, and facial soaps and related products for women and men. They also carry a line of shampoo bars, which are naturally cleansing for your hair without the extra foaming agents present in standard shampoos. They’re available in a variety of fragrances and are great for the health of your hair and scalp. 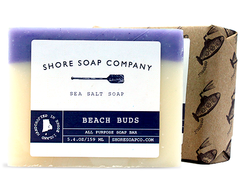 Choose from bath bars with a nautical Rhode Island theme, like Beach Buds (shown). This bar features sweet lavender and basil, as well as olive oil as a moisturizer. There’s also Changing Tide, with hints of lemon, patchouli, and sandalwood … wonderful as a Rhode Island themed gift! Kearsley is a graduate of the Rhode Island School of Design and just happens to be a descendant of the legendary pirate Captain Morgan, which in part inspired her company’s name. Women and girls will adore the patterns shown on her website – they adorn Tipsy Skipper’s line of casual shoes, sandals, and totes. If you’re looking for interesting gifts for the fun and fashion conscious person on your list, check out the Tipsy Skippers website – you’ll love the creative designs! One of the businesses located on the island is North Light Fibers, who hand weave and knit garments and home decor items from hand made yarn. 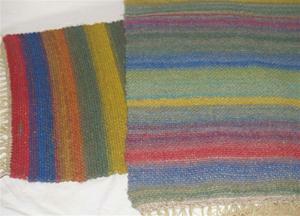 Among their many truly local products are baby blankets, throw rugs, hats, gloves, and other knit and woven items. Pictured are beautiful Block Island Sunrise – Sunset Rugs, which capture the colors of the sun rising and setting over the island. Several sizes and colors of rugs, throws, and place mats are available. 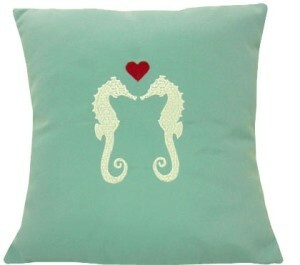 Any would look great in your home! Rhody Guest Soap Set – A Great Gift! Stella Marie Soap Company in Warren makes a wide variety of soap for both women and men. Most unique are their fruit and vegetable soaps, which contain fresh fruit and vegetable purees. Choose from Cucumber Slumber, Banana Smoothie, Avocado Dreaming, Tropical Rescue, and more. Stella Marie Soap also offers massage bars, body scrubs, gift sets, and a line called Rhode Island Bath and Body. This line features soaps and lip balms inspired by some of the state’s favorites. You’ll find a soap called “Home Brewed”, made with Rhode Island brewed coffee and Autocrat Coffee Syrup, and “Last Call”, a beer based soap made with the iconic Narragansett Lager! A Pizza Party For Your Pooch! Pictured is a pizza party for dogs. 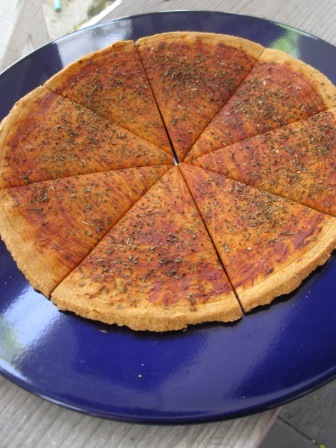 It looks like the real thing and even smells like the real thing as it’s made with basil and oregano! It feeds eight and is shipped in a pizza box – perfect if you’ve got a few furry friends! Jack’s Snacks also makes bone shaped birthday cakes, peanut butter treats, apple dog cookies, and sweet potato dog chews. You’ll find other useful ideas for your best friend on their website, like a special dog shampoo soap bar that’ll leave your pal’s coat shiny and smelling great! 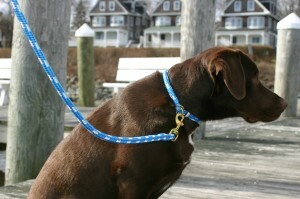 Check them out, and get your dog a tasty sample of The Ocean State! Visit the Rhode Island Monthly site to subscribe or send a gift subscription to someone on your list with a soft spot for The Ocean State! These one of a kind portraits are available directly from the Lighthouse Portraits Etsy Shop. Each portrait is identified on the reverse with the location and name of the lighthouse. A very special one of a kind gift from The Ocean State! The company is The Fair Lead and they create dog leashes and collars made from marine grade rope designed to stand up to even the most boisterous pooch. Available in many different colors and sizes, these handsome collars and leashes will have your dog as the talk of the boardwalk and beach! The Fair Lead’s leashes are practically indestructible … they have a minimum breaking strength of 3300 pounds and up to 7000 pounds. They’re eco friendly too – the rope materials are sourced locally and they’re produced locally as well. 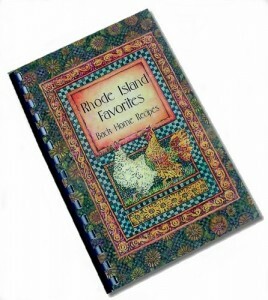 A great souvenir from Providence and an ideal Rhode Island themed gift! 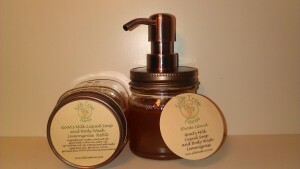 Island Mist Bath and Body: Island Mist Natural Bath and Body is a small company located on Block Island. This beautiful island is located 12 miles off the Rhode Island coast and 14 miles east of Montauk Point on Long Island, NY. This basket contains Taste of Summer Sea Bath, Ocean Facial Scrub and Mask, a lobster loofah, lavender and lemon lotion, candles, and a wooden fish soap dish. 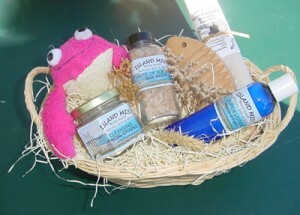 An ideal gift from iconic Block Island, RI! 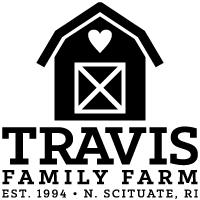 This particular site is great for promoting not only the design school, but the designers themselves. 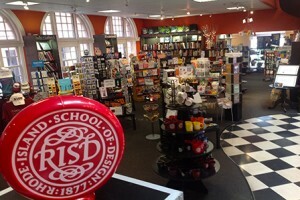 Shoppers get unique items made in Rhode Island and help sustain the creative process. Hundreds of really creative items are available … spend some time and take a look! Kenyon’s Grist Mill: A Rhode Island landmark, Kenyon’s Grist Mill is the oldest manufacturing business in the Ocean State … they’ve been grinding meal and flour at this site since 1696. The mill creates and packages old fashioned white corn meal, clam cake mix, bread and muffin mixes, and many other mixes. They also make sea salt from water collected off the Rhode Island coast, and to our knowledge are the only producer of sea salt in The Ocean State! 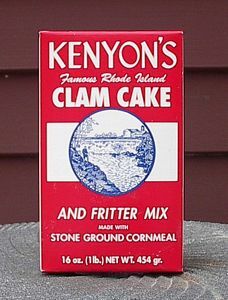 You can order these products directly at the Kenyon’s Grist Mill site and enjoy a true taste of Rhode Island pride! Their products are found in fine retailers across the country and they also offer shoppers a thriving online presence. 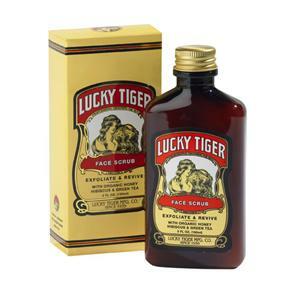 One of my favorite products is their Lucky Tiger Face Scrub, which is gentle enough to be used daily. Its key ingredients are honey, hibiscus, green tea, and calendula. The end result is moisturized and revitalized skin! Take a look at all the classic products offered at the Caswell-Massey website. Makes a great gift from the Ocean State! The collection at Christine’s CB Pottery Works Etsy shop is varied and well worth exploring … you’ll find mugs, dishware, candle sleeves, bowls, serving dishes, and many other one of a kind pottery pieces directly from her Rhode Island home studio. Truly original art from the Ocean State! Del’s Lemonade: Del’s Lemonade, a Rhode Island tradition since 1948, is really more like a slushie or a fruit ice … a mixture of lemonade, sugar, and crushed ice. It’s called a frozen lemonade and it’s beloved in Rhode Island. 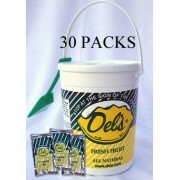 You can make Del’s at home from a packaged mix that’s available at Del’s online store. 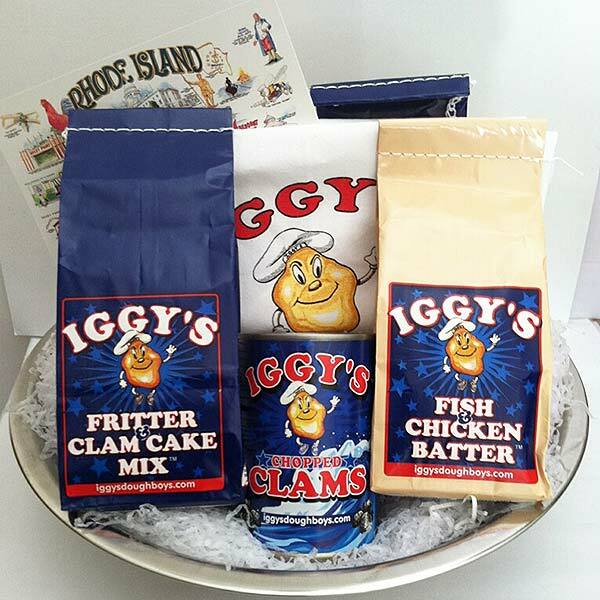 It includes individual serving packets along with instructions … bring a taste of Rhode Island into your home! 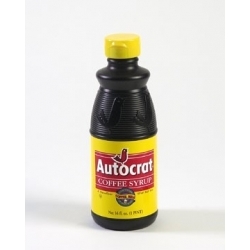 As the story goes, coffee milk was originally concocted in a Rhode Island diner sometime in the mid 1930’s. 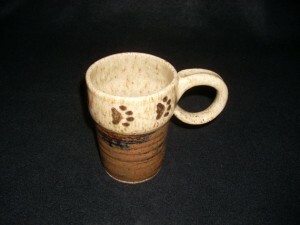 The owner mixed coffee grounds with milk and sugar to create a syrup like liquid, which he then added to milk. The rest is history! So, just to review … Olneyville is the square in Providence where the restaurant is located, N.Y. stands for New York, where the family lived before settling in Rhode Island, and System is the system of assembling the hot dog. Whew! All we can say is, order the spice packets and try it for yourself! 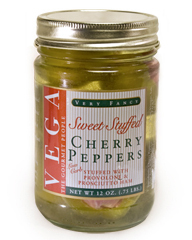 Pictured is a jar of the stuffed cherry peppers. They also make a very interesting product called Pepper Poppers, which are single serve vacuum packed hot stuffed cherry peppers. Sea Breeze Creation: Tiverton, RI artist Barbara Cook-Kohler creates some beautiful works of art using Rhode Island sea glass and beach stones. Some of the pieces are jewelry, like earrings and pendants, while others are like the one shown in the photo … a moon lit beach solar antique Mason jar. 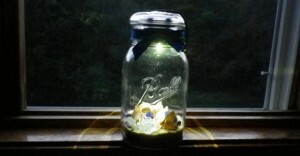 Barbara takes a quart Mason jar and puts beach sand in the bottom, along with beach stones and shells, along with sea glass. The top lid is affixed with a small solar panel. Leave it in the sun or light during the day and at night, you have a beautiful moonlit beach scene! You can literally have the Rhode Island beach at your finger tips all year around … what a clever idea and a great gift from The Ocean State! In addition to fresh seafood, The Black Pearl is famous for its legendary clam chowder. 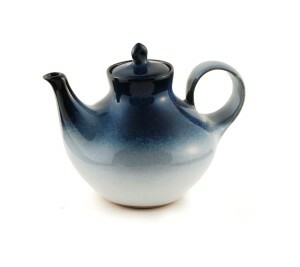 If you can’t get to Newport, you can order some online at BlackPearlNewport.com … just heat and serve! Dotterer’s Mustard: Dotterer’s Mustard has been a Newport RI staple for years … it’s available in small quantities around the Ocean State at specialty grocers. In addition to mustard, they also make a really good hot pepper jelly which you can serve with roast beef sandwiches … might not sound like the ideal combination but you’ll be surprised how good it is! Order Dotterer’s Mustard and Hot Pepper Jelly online here at the Dotterer’s website. We’ve Got More Rhode Island Made Products Coming Soon … Tell Us About Your Favorites By Touching Base Via Our Contact Form!